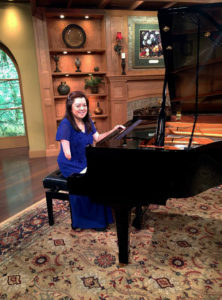 Thank you so much of your love, faith and devotion to support the Lord’s work here on earth. May the Lord bless you until Jesus comes. Here is my October report about our evangelistic crusade here in Trento District Agusan Del Sur. 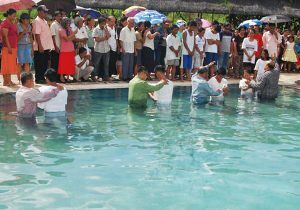 We baptized 153 precious souls who accepted Jesus Christ as their personal Savior last October 16, 2010. Our guest speaker was Pastor Samuel Arthur Bushnell Jr. from Central California USA . Before the crusade, we visited homes and gave Bible studies, which resulted to many souls for Jesus. Our Lord Jesus is so good and gracious. He works in so many wonderful ways despite the odds. 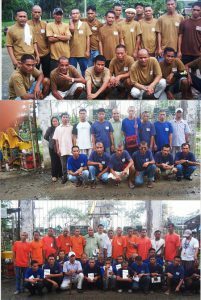 31 inmates in Dapecol (sixteen(l6)from the maximum security in orange t-shirt uniforms and fiteen (15) from the medium compound (in blue t-shirt uniforms) recently graduated from VOP last November 27, 2010. Pastor Dennison Moralde, our VOP Director of Davao Mission, baptized ten (l0)medium inmates. It was a solemn and happy occasion since it was also our joint fellowship. Now, we are nurturing the new brothers in Christ inside the prison colony. There are also several SDA brethren in the minimum compound who will be released from prison in the near coming months (see them in brown t-shirt uniforms). Thank you so much for your untiring support.